This is the story of how Tai and Kari met their first Digimon, and how the rest of the original Digidestined were chosen. On one quiet day, a digi-egg appears in Tai's computer. It hatches into Koromon, who quickly becomes their new best friend. Tai and Kari have a chaotic day where they try to play with Koromon and keep him out of trouble. 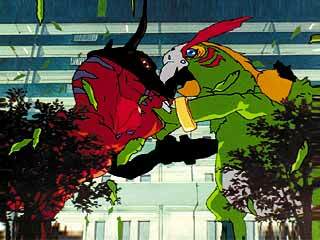 It gets worse when he digivolves into a giant Agumon, and starts to wander around the city. The barrier between the real world and the digital world is still weak though, and a gigantic menace, Parrotmon appears. Inspired by Tai's courage and Kari's gentle heart, Agumon finds the strength to digivolve into Greymon and defeat this enemy. In the United States, this would be compressed to form 1/3 of the the Digimon Movie.